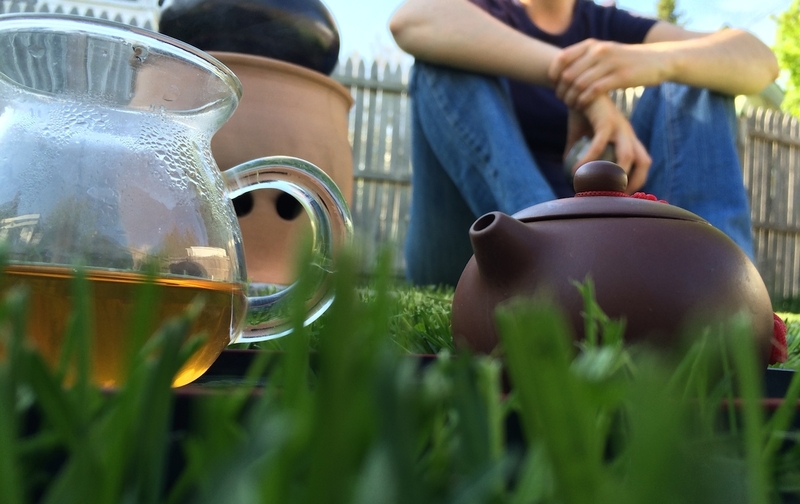 The seasons have changed, and with green grass and warm sunshine comes a perfect time to make tea outside. To celebrate the occasion I’ve pulled out my ceramic tea stove and some rather delicious sheng Puer that’s this month’s offering from Jalam Teas. Of course, in the two seasons since I’ve used the stove, I’ve forgotten somewhat how best to get it going. It’s not the most complex device, but as my previous entries on the subject suggest, if I want to brew tea before too many hours have passed there are some tricks I need to know. Caveat lector: I’m equally unskilled at building campfires, so it’s not just this particular firebending with which I have trouble; I think I was born into the water tribe. I may need to get some practice lighting charcoal this summer. Thankfully, with some patience and the meticulous skills of my wife, boiling water was not far off. There’s something really magical about heating water on a stove like this. I think because the water comes just to a boil without sending the lid flying across the room. When I’m using a gas range or electric kettle the water tends to get a little out of control. There’s often a sense of, “Oh no! The water is boiling; I need to shut it off before it’s too late!”, especially if there’s a shrieking whistle going off. The gentleness of boiling water on the tea stove seems to me a perfect complement to the essence of a tea ceremony: in the constant sound of the boil and the occasional hiss as a drop of water escapes only to instantly evaporate on the side of the stove, I find a feeling of tranquility and the natural order of things. I don’t have a lot to say about the tea itself, other than that it’s really very delicious for being so young. The liquor is a beautiful amber, and the aroma is woody, but not overly so. It actually seems more oak-like than the cedar scent I expected, and is quite smooth (at least brewed gong-fu style; I haven’t tried any other way). I think that with some age it may produce more bold flavors, but I like the subtle taste and potent energy that it carries. It’s a young, but very dignified Puer and I feel very fortunate to have such a cake. 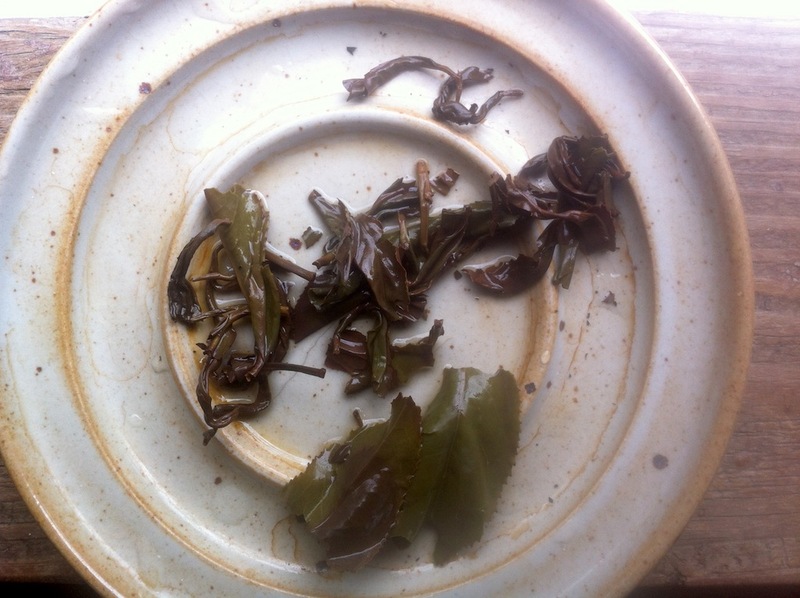 Jalam’s site names this tea an Autumn 2013 harvest of Meng Hun, from southwest of Menghai county in Yunnan, harvested by the native Lahu people. From the description, I really was expecting a tea that should be stored away for a few years before even sampling, and maybe my taste is unique, but I really am enjoying this cake right now! 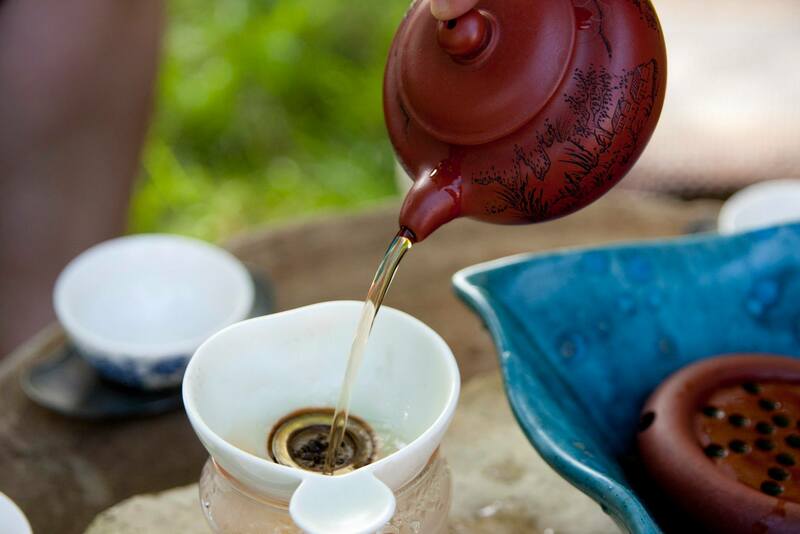 Tea is a reminder that we are all interdependent. From the native people growing and harvesting these leaves to all the fine people at Jalam teas for getting the final product to my door, to the amazing pottery of Petr Novak without whom I would not have this lovely kettle and stove, they are all equally important. Even my water, kindling, and charcoal are derived from the hard work of many humans. Without any one of those people, the tea in my cup would not exist. 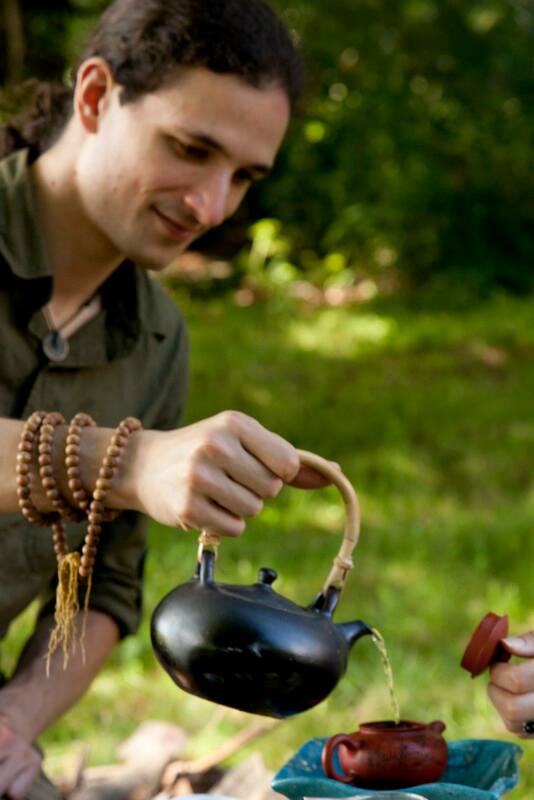 Drinking tea with mindfulness is paying tribute to all those who provided this day for me. I hope to have many more days like this, and I hope that you do too! 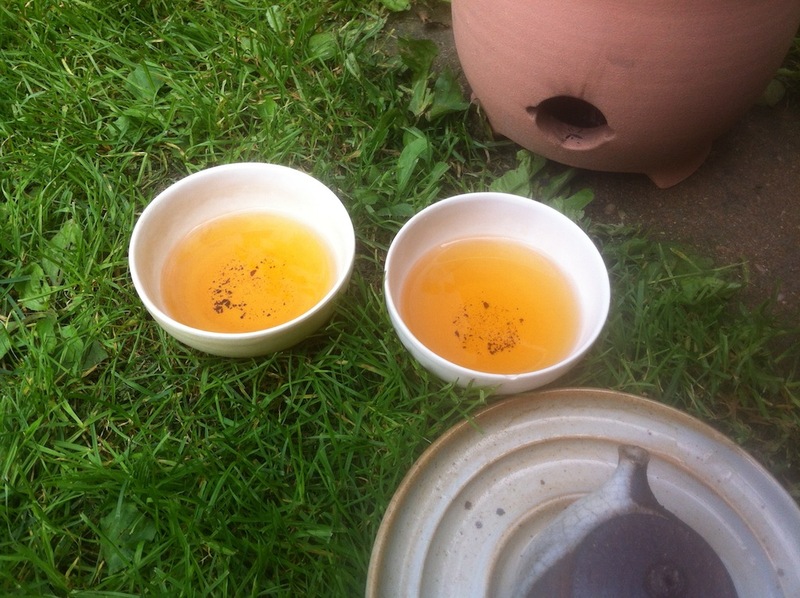 This entry was posted in Method, Tastings and tagged brazier, jalamteas, puer, sheng, stove on May 27, 2014 by payton. Yesterday my excellent friends Ben and Sarah joined my fiancée and I for an outdoor tea session to celebrate our upcoming wedding. The weather cooperated and we spent around four hours talking, sipping, and taking pictures. Now normally when I get together for a long tea session like this one, we blast through as many infusions as we can make, savoring the contrast between each cup before moving on to a different tea. This time we only drank one tea, and although it made us a good 20 infusions, they were often spaced apart by 15 minutes or longer. The reason for this, besides various photo-ops, was the tea stove. 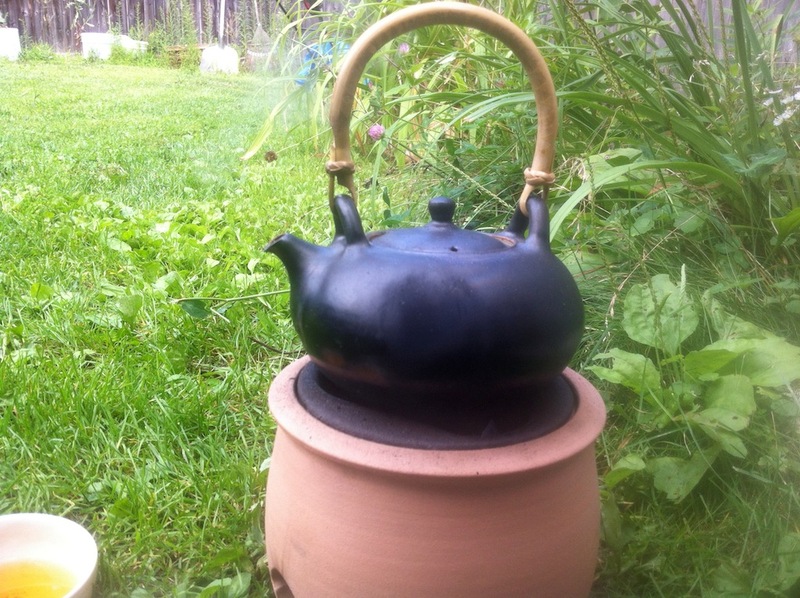 The tea stove and accompanying kettle are things of beauty hand crafted by a potter I cannot praise highly enough, Petr Novak. When my partner and I decided we wanted a tea ceremony as part of our wedding many months ago, I asked Petr to make this set for me. Our wedding will be outside and I felt that it would be a good touch to have a real brazier heating the water we would use. 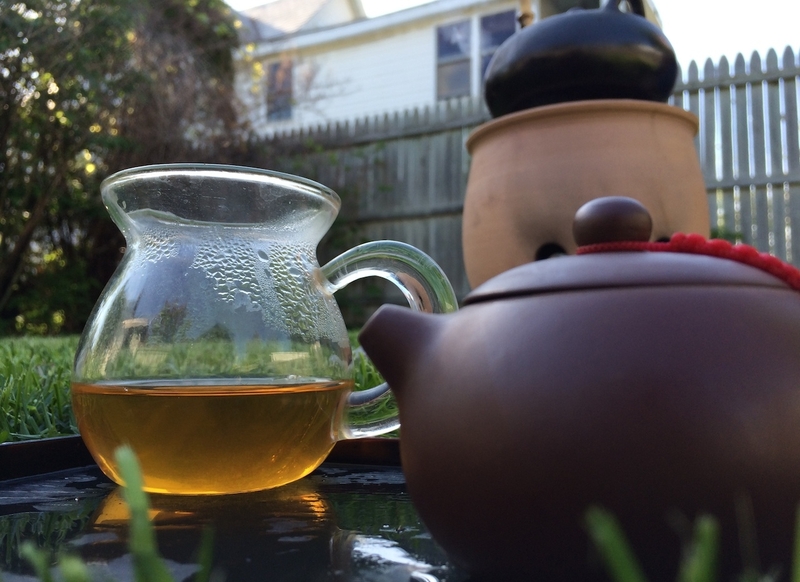 So, after much back-and-forth about the shape, size, and style, the tea stove arrived at my home to great fanfare. The only problem was that it was too cold and too rainy out to use it. So for months I’ve been keeping my thoughts on the stove, waiting for just the right time to inaugurate it. After all, I’ve never used a charcoal anything before, let alone a small clay burner such as this. So when yesterday arrived, and we had set up the stove next to a handy pile of kindling and charcoal, the real adventure began. First we got a small fire going with kindling and a little paper, then we added small chunks of charcoal over that, allowing the burner to heat up to a temperature we could use. The challenge, I suppose, was that the actual area where the charcoal sits is quite small, probably about the size of a cupped hand, so we had to tend the fire carefully. Naturally we made many mistakes, but eventually our first kettle came to a boil and began a series of really wonderful infusions. To that end, I should mention the tea! Ben had provided a piece of a Red Mark (Da Hong Yin) Sheng Puer from the 1950s. What a treat! I think a little smoke taste had accumulated in our first cup, because we all thought it tasted a little like firewood, but after that the infusions were smooth and earthy with an aroma a little bit like dark cocoa powder. The color of each infusion was a transparent reddish brown that only started to turn yellow around number 10. Other than the first, the taste was also remarkably uniform and satisfying. 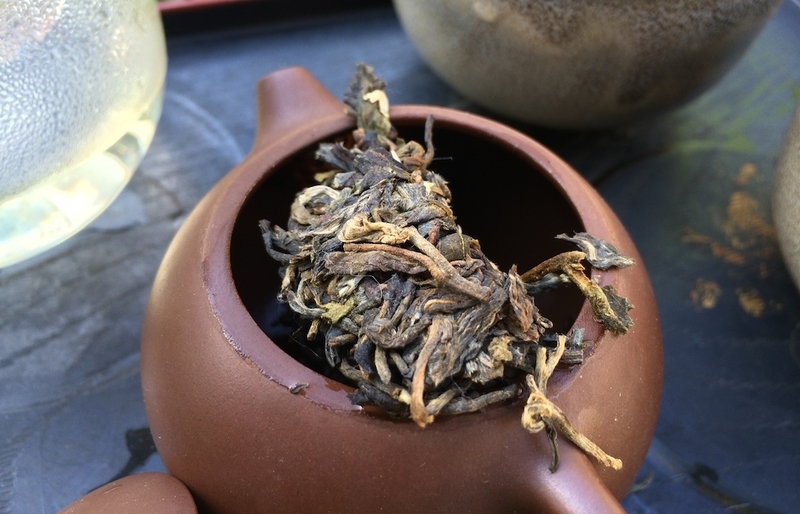 It’s important to have sessions like these to remind oneself that young flaxen sheng cha eventually matures into rich old cakes that could be mistaken at a glance for a shou puer. 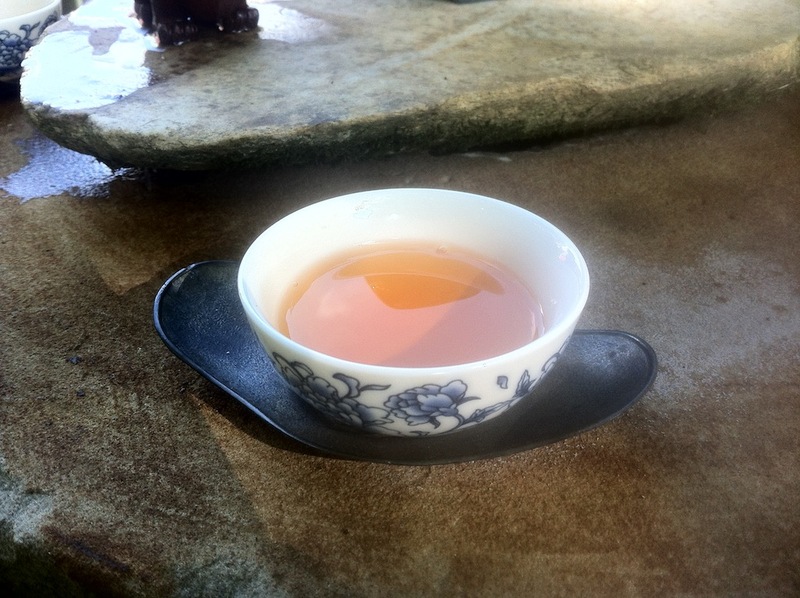 But of course, that’s what shou puer is often made to mimic in the first place! The real thing can’t be compared. It turns out that I really enjoy tending a fire for making tea. Even though it took quite a while (especially when the fire died down) to boil the water each time, it made the whole experience more rich. I was always adding a little wood, some coal, and listening for the singing of the water. And it wasn’t without help! I am humbled to have such friends and such tea in my cup. 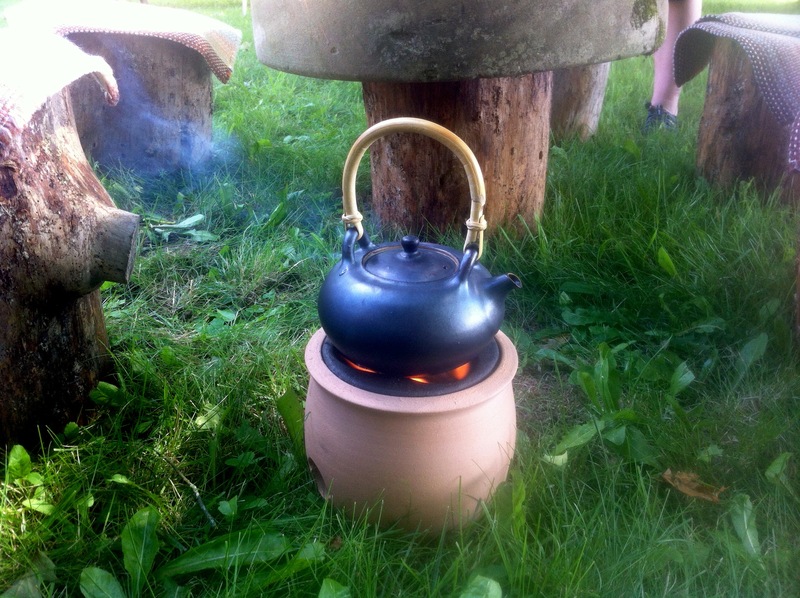 More tea stove adventures to come! 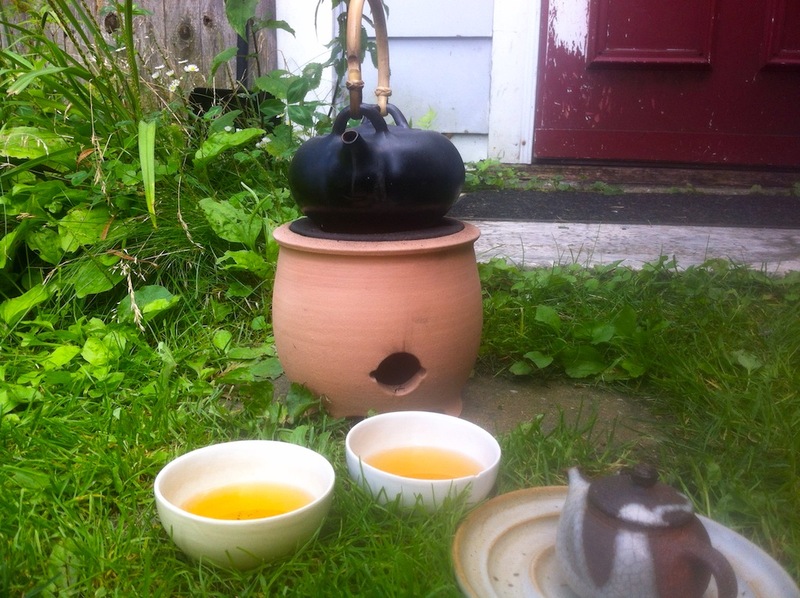 This entry was posted in Tastings, Teaware and tagged brazier, chaxi, heicha, kettle, puer, stove, tea, wedding on July 15, 2013 by payton.